The winter season has arrived, snow has been falling, and it is time to hit the slopes! When it comes to the sport of skiing, the first thing I think about is having strong legs. Having spent some time out on the slopes myself, a typical day of snow skiing can involve using our leg muscles anywhere between 4-7 hours. Performing a variety of squat exercises on the Total Gym is a great way to build and maintain your lower body strength so you can enjoy your full day out on the mountain. Before participating in any sport/athletic activity I always like to emphasize the importance of a good warm-up. Taking just a brief five to ten minutes to get your muscles warm and heart rate up not only prepares your body and muscles for a workout, but it also helps with injury prevention. With that being said let’s get started with a basic warm-up before our ski-inspired squat workout on the Total Gym. Standing off to one side of your Total Gym we are going to begin with a basic squat including lateral arm raises. Stand with your feet shoulder width apart and pretend to sit in a chair as you raise your arms up by your sides towards the ceiling. This move will begin to warm-up some of our largest muscle groups first including the quads, hamstrings, and lats. After you have performed about ten to twelve reps take a short break and continue with a second set before beginning your lower body routine. We use both our upper and lower body when skiing so we will begin with the cardio pull including a squat. Grasp the handles, face away from the tower, straddle the rails, and sit towards the bottom edge of the glideboard. Keeping tension in the cables, place your feet on the squat stand and slowly lie back making sure your head is supported and your hair is tucked underneath your neck. With your palms facing each other bend the elbows and bring the handles to shoulder height. With your feet remaining on the squat stand, simultaneously pull the handles down to the shoulders and press your feet into the squat stand to return to the starting position. Perform 2 sets of 10-12 reps, with a short break in between. Continuing to build and maintain our overall body strength now we will integrate an oblique crunch. Remain on your back, in the same position as the cardio pull with squat. Keep the handles in your hands palm facing up and simultaneously begin to pull the right handle towards your left knee as you lift the left foot off the squat stand and bring your right shoulder blade off the glideboard. Perform the same move on the other side as you rotate lifting your right foot off the glideboard with your left hand moving towards the right knee. Do your best to distribute the force evenly between the upper and lower body throughout this exercise. Perform 2 sets of 10-12 reps, with a short break in between. In many sports having strong legs/quadriceps really helps. Performing a bridge squat next will keep your lower body feeling strong, and ready to tackle that next challenging ski run. Disconnect the pulley from the glideboard. Push the glideboard half way up the rails, straddle the rails, and sit towards the bottom edge facing the tower. Place your feet toward the top of the squat stand, shoulder-width apart. Slowly lie back, ensuring your head is rested and your hair is not near the pulley. Rest your hands on the side of glideboard, and in a neutral spine position slowly lower the glideboard by bending both knees and hips to around 90 degrees. Press your feet into the glideboard and begin to move up the rails as you lift the glutes and low back off the glideboard into a bridge position. As you begin to move down the rails you will simultaneously lower your buttocks and your lower back on the glideboard and return to the same starting position. Make sure you take your time during this exercise. Inhale and exhale at a slow and steady pace. Perform 2 sets 10-12 reps with a short break in between. Snow skiing is a sport that involves speed, time to increase the pace and get our heart rates going. Disconnect the pulley from the glideboard, straddle the rails, and sit towards the bottom edge of the glideboard as you lie back facing away from the tower. With your feet shoulder-width apart on the squat stand, slowly slide down the glideboard by bending both knees and hips. Rapidly press your feet into the squat stand to accelerate up the rails in a jumping manner. Land softly on the squat stand by decelerating through the range of motion and repeat. Staying with our ski-inspired routine, keep your feet and ankles together as you press off the squat stand and land with them together rotating from right to left just like you are skiing down a mountain. Now add a little more fun by kicking out your hands and feet at the same time forming a star like symbol as you continue to push off the squat stand moving up and down the rails. For the cross country skiers preparing for those longer trail runs, the lunge with upper body rotation is a great way to keep your quads and hamstrings feeling strong. Exit off the side of your Total Gym and face straight ahead. With your feet shoulder width apart and your hips facing straight ahead lunge with your right foot forward. Return it to the starting position and then alternate on your left side. After a couple of reps on each side we will now add an upper body rotation by turning our shoulders to the right side with our arms raised, elbows bent below our shoulders. Continue to lunge forward with the right foot. Alternate with the same movement on the left side. While it is very important to perform a proper warm-up the same goes for the cool down. We performed a number of squats and lower body exercises so we will begin with a good quad stretch. You may want to find a wall or go to the side of your Total Gym tower and bend your right leg as you grasp your foot or ankle and feel the stretch in the front of your right thigh. Repeat this same stretch on your left side while holding for approx. 20-30 seconds. Standing tall move your right leg straight out to your right side slightly to the front, point your right toe, and lean back into your left hip as you move your chest down towards your thighs. Repeat on your left side, holding the stretch for approx. 20-30 seconds. Time to stretch the hips and glutes. With both hands on the squat stand face forward and place your right knee on the glideboard. Keep the left foot on the ground with the knee bent directly over the ankle. Lightly press your right knee into the glideboard as you allow it to move up the rails until you feel a good stretch in the front of your right hip and glute. Hold briefly and repeat on the other side. The benefits of these ski-inspired exercises on Total Gym should keep your lower body feeling strong while maintaining good core strength to enjoy a full day out on the slopes. By performing these exercises regularly one can benefit by increasing lower body strength and improving stamina whether you ski or not. Keep in mind, the higher you position the rails the more challenging the exercise will become. Now go put on that winter ski gear, grab your skis or snowboard, and enjoy some fun out on the mountain! Join The Total Gym Fun! 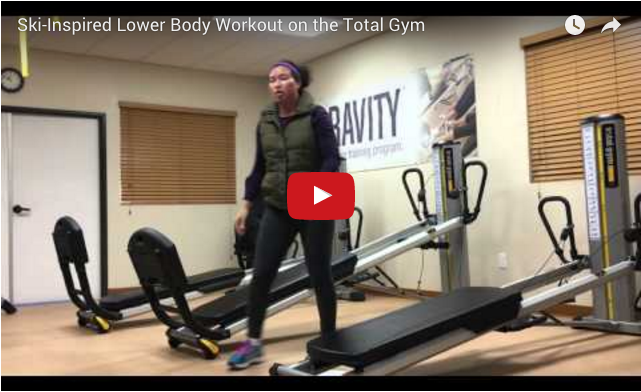 Have you created a favorite lower body workout routine on the Total Gym? Have these exercises inspired you to hit the slopes? Email us a photo, video, or on Twitter (@TotalGymDirect) and Instagram (@TotalGymDirect). We would love to hear your thoughts.